The popularity and affordability of 360 cameras is certainly on the rise, but before we catapult ourselves into an immersive utopia what are the key points we need to consider? After trying out a Samsung Gear 360 camera I’d like to share my observations as well as the challenges you might face when creating your own 360 videos. Disclaimer – there are many other (and arguably better) alternative 360 cameras out there. Take a look at Ben Claremont’s review of a range of 360 cameras on YouTube. 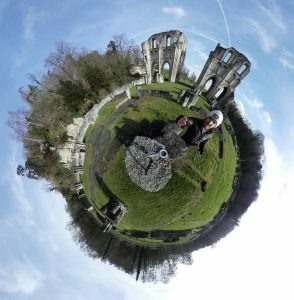 A ‘tiny planet’ photo of Roche Abbey, taken with the Samsung Gear 360. One of the first considerations to make is where to do the shooting. Luckily, there’s a beautiful abbey a short bike ride from my house. 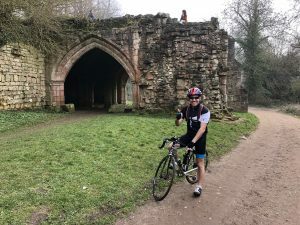 I’ve shared the 360 footage of the bike ride to Roche Abbey below. My aim is to give you a taster of three different scenes with a 360 camera, rather than tell a story (it’s an unscripted video). I want to use the scenes as a platform to discuss the issues you are likely to face shooting 360 video. A common assertion made about 360 video is the immersion factor. I think that’s true, the first person perspective is more immersive than normal ‘flat’ video. Take a look at Taflinger’s article What makes a good 360 video? on the BBC site for a number of compelling examples. However, before we get too quixotic, it’s worth thinking about your potential audience and how they’re likely to view your video. It’s likely that many of your viewers will be watching the footage on their smartphones or desktops. Although you can scan round the footage by clicking and dragging on screen or by pointing your smartphone in different directions it’s not nearly as immersive as wearing a virtual reality headset. The first example in my video, the bike ride, places the viewer on the bike itself. YouTube’s VR channel is awash with examples of extreme sports for the adrenaline junkies amongst you. Dramatic shots really contribute to the immersion factor, but too much movement can also be disorientating for the viewer and lead to virtual reality nausea (more on this later). I’m not entirely happy with this first shot, but to be fair, I wanted to be a little ambitious. Moving shots make camera placement especially challenging – partly because you want to avoid damaging the camera. I attached the camera to the handlebars with a Joby GripTight GorillaPod. You can buy specialist stands that attach to bikes, which help to stabilise the shot. It’s worth noting that some 360 cameras are much better than the Samsung Gear 360 for this type of moving shot and have settings to stabilise the shot even further. One popular use of a motion shot would be to provide viewers with virtual tours. This has plenty of possibilities in an educational context (open days, library tours, inductions and so on). Virtual tours tend to work well as the audience has a vested interest in looking around and experiencing the view in 360. With normal ‘flat’ video the viewer follows a more linear route than 360 video, making it easier to focus on a particular spot. Yes, you can control where you place the camera, but there’s nothing to stop the viewer looking where they want. 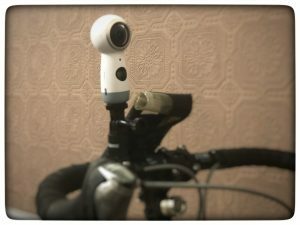 What works well with standard video doesn’t necessarily translate well into 360 (and vice versa). For example, one shot I often take with video is a ground level shot of someone physically walking or running over the camera (see the Dartmoor Drone run at 1 minute 36 seconds in). By limiting the canvass size it’s easy to create a sense of speed and action. However, this is jarring for a 360 viewer, because it feels like their head is on the ground (which may be an effect you want to produce if you are filming Gulliver’s Travels from the perspective of the Lilliputians, but for a tour or a ruined abbey?). Although viewers in 360 have the freedom to look around most people tend not to turn their heads too much. Google carried out research with heatmaps on VR videos with more than a 1,000 views on YouTube to reveal where users look. The research found that 75 percent of viewers only look at the front quadrant of the video. With this in mind, I tried to keep the important objects I wanted the viewer to focus on in that front quadrant, with less important objects in the periphery. The Samsung Gear 360 camera uses two fisheye lenses that capture 180 degrees each and merge them together (called ‘stitching’). There can be issues with this – I used the Gear 360 Action Director software to stitch the footage together, but this can sometimes produce a visible stitch line. Remember to place any objects in shot central to one of the lenses wherever possible, otherwise the stitch line will become even more apparent. You can see this in the first scene on the bike, because my arms are unavoidably close to the stitch line of the camera on the handlebars. Reports of virtual reality sickness are fairly widespread across the internet with symptoms including headaches, nausea and disorientation. Consider the comfort of your viewer and factors like the genre and length of video you are producing will play a part. If you are doing a horror short for example, you might want to cause unease and stress in the viewer by forcing them to look around a lot. Take a look at 3am by Dimension Gate if you like jump scares. Here looking around adds to the experience, but if it doesn’t then the 360 view could arguably be perceived as nothing more than a distraction. Alex Chu of Samsung Research in his presentation VR Design: Transitioning from a 2D to a 3D Design Paradigm argues that the distance you place objects from the camera not only affects the viewer’s perception of 3D, but it also impacts on the viewer’s comfort. With stereoscopic viewing the further away the object is the more that object will be seen as the same by both eyes, losing that sense of depth. Similarly, if the object is too close to the camera this has the reverse effect with the viewer effectively having to look cross-eyed to see it, causing eye-strain. The phrase “too close for comfort” comes to mind! There are ways you can mitigate discomfort for the viewer. For the second scene at the waterfall in my video I used the Manfrotto Compact Monopod, because it extends to a height of 145.5 cm (roughly eye-level) making it perfect for talking shots. Chu also noted in his research that viewers don’t mind looking from left to right too much, but looking up and down is less common as it causes more discomfort. Keeping the shot at eye-level means the viewer doesn’t have to crane their head up or down. If you are using a tripod, just be careful to choose one with a small footprint otherwise it will show up in shot. If you look down in my third shot of the abbey you will see exactly what I mean. Finding the right shots that add value without causing discomfort or being a distraction can be a tricky balancing act – remember the 75 percent! Sound is always an issue when shooting video, whether it’s the quality of the sound or unexpected sounds disrupting the shot. There’s always the option of taking the sound out completely and adding it in later, but sometimes the sounds in the scene complement the shot. This was a big issue in the first scene with the camera on the bike, leaving the mic susceptible to lots of wind disruption. Thankfully, there is a “reduce wind noise” setting on the Samsung Gear 360, which helps a little, but the wind is still perceptible. Another consideration is whether or not to add music and whether the style of music complements the shot. I’d just like to give a hat-tip at this point to Kevin MacLeod’s excellent music which I used to create a medieval vibe in my third scene at the abbey (available on Soundcloud under a Creative Commons licence). Although 360 video has been around for a while it’s still not in the mainstream yet, which creates a few extra steps in the editing stage. The Gear 360 Action Director video-editing software you get with the camera is basic and very limited. Gear 360 Action Director will automatically stitch your videos, allow you to add titles and transitions, but won’t do anything too sophisticated. The length of your video and processing power of your PC are also key factors to stitch and produce even a short 360 video (360 video produces some big files). I’m a Mac user who tends to use iMovie as my default for video-editing. Yes, you’ve guessed it – you can’t publish 360 video in iMovie. Investing in video-editing software like Adobe Premiere is your best option, but this may be beyond the budget of many teaching staff looking to do a small-scale 360 video project with students. Making sure the things you don’t want to appear in shot don’t can be a real challenge. I’m thinking about things like lighting, microphones or even the person doing the shooting. In the shot in the abbey I had to hide behind a column to make sure I was out of shot. Consider where you can hide if you don’t want to be in shot – this could be quite tricky for some locations! There is a lot of innovative practice out there when it comes to 360 video. I have learnt so much by trying it out and I can certainly recommend giving it a go. If you would like to try making your own 360 videos I’d start by exploring the plethora of content freely available on YouTube’s VR channel. Chris Long presenting at Jisc’s first VR meetup in London. 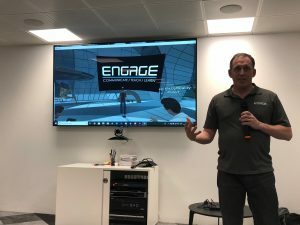 Jisc is also showcasing how immersive technologies can be applied in a series of events around the UK – the first of which took place in February in our London office. Here Chris Long showcased the BBC’s 1943 Berlin Blitz project and we provided our members with a forum to share their own ideas and network with peers across education and industry. We also have plans to develop an ‘immersive technologies toolkit’ to help our members make informed decisions about how they can make best use of immersive technologies – watch this space! If you are interested in developments arounf 360 video and immersive technologies you can find out more on the Jisc website or by using the hashtag #VREducation on Twitter. Posted by Scott Hibberson on March 19, 2019 in Events, Good practice, Reflections, Watch this space and tagged 360 video, Creative Commons music, digital media, Immersive technology, Jisc, video, Video editing, Virtual Reality, Virtual reality sickness, vr.